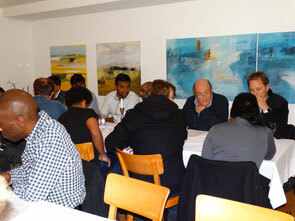 Winterthur Cricket Club's Annual General Meeting took place on Monday 14th March 2016. John Hallam was unanimously re-elected as President, alongside Alex Mackay (Vice President), Jiten Patel (Treasurer), Matt Allen (Secretary), Tom Mampilly (Captain) and Graham Deacon (Social Secretary). To complete the committee, Prafull Shikare and Andy Wilson, replacing the absent Chris Lodge, were elected Ordinary Committee members, Phil Martin and Ray Goddard club auditors. Additionally, Honorary Membership was bestowed upon Helen Lippuner after 30 years of membership, and the meeting agreed by a majority of just one vote to keep membership fees unchanged. Prior to discharging the 2015 committee, the meeting heard John Hallam's President's Report and a very thorough Treasurer's Report from incumbent Jiten Patel. Further information on the Annual General Meeting is available from WCC Honorary Secretary, Matt Allen.